8.8 Our Score The Shark IF200UK DuoClean (or one of the other versions) is a great buy at this price point! What Is the Shark IF200UK DuoClean? We’re currently living in an era where companies are fighting over the cordless appliance market, leaving few scraps for smaller companies to pick up. In this regard, the aptly named ‘Shark’ company which is a subsidiary of Euro-Pro Europe has got some combatants of their own. In fact, they’re so confident that all their vacuum cleaners come with a standard five-year guarantee. Earlier on we reviewed their upright Shark Lift Away True Pet model which was very well received, even though it had a somewhat unusual design. 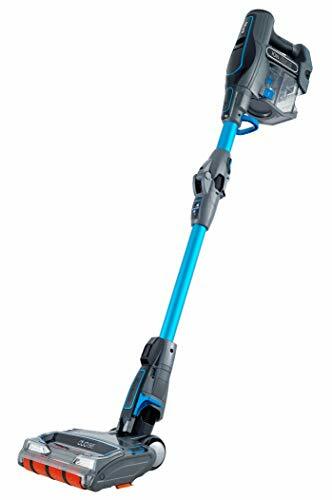 However, the Shark IF200UK DuoClean which we are looking at today differs in that it is a cordless stick vacuum that can also be used as a handheld. It’s much lighter as well which means it’s the more practical choice. Having said that, the battle that this model will face between its competitors will come down to battery life, suction capabilities and versatility. In our bagless Shark IF200UKT review, we’ll be looking at their cheapest model which is still a great all-round machine, but it’s worth keeping in mind that they have three other DuoClean versions which we’ll discuss in the design section below. Read on to find out what we thought. Floor Versatile – Unique DuoClean technology allows this vacuum to transition seamlessly from hard to carpeted flooring without needing to change heads. 2-in-1 Functionality – Easily converts into a handheld which makes it possible to use this vacuum for a wide range of cleaning applications. Intuitive Design – Simple interface within thumb-reach to turn on the power as well as adjust the suction and floor settings. Impressive Guarantee – The DuoClean comes standard with a 5-year guarantee (although the battery is only covered for 2 years). Runtime – Unlike many top of the line cordless models the 22-minute runtime isn’t impressive, especially considering this is when using the ‘standard’ mode. On the max setting, it only runs for 10 minutes. Top Heavy – Although relatively lightweight at 4kg, some people with arthritis or other ailments may find the DuoClean to be top heavy and a strain on their wrists. Flexology Flexi Wand – This is not just an enticing marketing name but refers to the flexology lock release which allows you to lower the angle of the wand to easily reach under furniture. The top half of the vacuum cleaner also folds over on itself which allows for more compact storage – including easier access to a handle to carry it around. DuoClean Head – The DuoClean head features two brush rolls, one which has stiff bristles and another which is a soft brush. This makes it possible to easily pick up both small and large particles, as well as easily transition from carpet to hard flooring. 2-in-1 Functionality – In addition to easily removing the head for ceiling cleaning, it’s possible to completely detach the wand and use the main unit as a handheld. Here you have the option of using the DuoClean head without the wand for easier stair cleaning, or use one of the provided attachments for cleaning tabletops, edges and more. The Shark IF200UK DuoClean features a 25.2V lithium-ion battery which is designed to provide continuous power for up to 22 minutes. By modern top-of-the-range cordless vacuums, this isn’t particularly impressive, although the Shark has found a compromise between suction power and runtime so that for those 22 minutes it works surprisingly well, and you also have the option to use a max setting for around 10 minutes. The battery takes around 3½ hours to fully charge (often much less), and you have the choice to charge the battery either while it’s connected or removed from the vacuum. There is three blue LED indicators on the battery to let you know how much juice is left, as well as when it’s fully charged. A couple versions of the DuoClean come with two batteries as standard and therefore include a dock that allows the option to charge both batteries at once. If you buy one of the single battery versions it’s possible to purchase a spare for £69.99 as well as the dock for £99.99, though you may as well purchase one of the versions with these included if you want the additional battery as it’ll work out cheaper. As if choosing a cordless vacuum cleaner wasn’t hard enough with the number of viable products on the market, the DuoClean comes in four different versions. All are essentially the same machine, except that they are available in different colours, come with various accessories and some have two batteries to make up for the feeble runtime. IF200UK – Blue version with a single battery, 20cm crevice tool, upholstery tool and dusting brush. IF200UKT – Pink version with a single battery, 20cm crevice tool, upholstery tool, dusting brush and motorized deep cleaning pet tool. IF250UK – White and orange version with two batteries, 30cm crevice tool, upholstery tool, dusting brush and anti-allergen dusting brush. IF250UKT – Deep navy version with two batteries, 30cm crevice tool, upholstery tool, dusting brush, anti-allergen dusting brush and motorized deep cleaning pet tool. The IF200UK is the model we are reviewing as it is on sale (you’ll read one or two angry reviews of people who jumped the gun before the sale when you do your research), and is more than adequate for most cleaning needs. If you choose to purchase this version there are a wide range of spares and accessories available on Amazon or the Shark website which includes the various attachments (including a car detail kit), filters, replacement rollers and more. The motorized mini pet tool is especially popular among people who are constantly caught in the middle of the great saga between furniture and pet fur. Moving forward, the DuoClean is a smart looking cordless vacuum cleaner in plastic with a metal wand, that has a durable and well-thought-out design that is easy to assemble without the instructions. All the sections and attachments fit into place with a satisfying click and it’s easy to switch applications whether you want to use the DuoClean head to clean your floor (which also features twin LED lights to help you see what you are hoovering), the wand for higher up or the handheld which has a comfortable handle. On the back of the unit is an interface with modern LED symbols and selectable settings so you know what mode you are using – which includes the power on/off, suction power and floor settings. The bin capacity is a little on the low side at 0.33 litres but it’s easy to empty each time you clean. The DuoClean uses two filters (foam and felt) which are washable, and the unit contains an allergy seal to ensure the air that’s expelled is hygienic and easier to breathe. One big negative point that stands out when first looking at the Shark IF200UK DuoClean is the 22-minute runtime. However, it’s easy to see how Shark have justified this when you notice the suction capabilities of such a light and cordless machine. It has no trouble at all picking up light and heavy particles, as well as debris that often remains on the edges or gets stuck between floorboards. The head is especially impressive and easy to move around when using the vacuum as a ‘stick’ or upright thanks to the flexible joint and wheels. The ability to also use the head on the handheld makes this a great option for those with stairs. The option to adjust the angle of the head is meant to allow you to easily vacuum under furniture, however, this isn’t as large a selling point as they make out as your furniture still needs to be taller than the cleaning head. However, for those with suitable sofas, this will be particularly useful, though it’s easy enough to just use the wand with one of the attachments if you choose. These dusting and upholstery attachments also come in handy when cleaning curtains and cobwebs off the ceiling, as well as the crevice tool for reaching behind or along the side of dressers and cabinets. The handheld is easy to use and can be great for when you want to quickly clean up a spill in the kitchen, clean upholstery, or go over the car. You may find when using it that the max power setting is more suited for vehicle cleaning. Overall, this is a good little hoover that has impressive cleaning abilities and it works well on various flooring types. However, we’d hazard to say that those with hard flooring would benefit the most. A couple of cons are that it fills up pretty quick and isn’t ideal for those who have long haired friends (and pets). At the time of writing this review, the IF200UK DuoClean is on sale at £199, although the regular price is £349. This is a bit of a bargain compared to other similar cordless 2-in-1 stick models on the market. If you’ll be using the vacuum cleaner for whole home cleaning rather than spot cleaning (especially if you have a large house) you may want to consider one of the dual battery models though they aren’t currently discounted. The 5-year guarantee also provides peace of mind for first time Shark buyers as well. If you’ve been searching through several cordless vacuum cleaner reviews and stumbled upon this, you’ve no doubt heard of the new Dyson V10 which we wrote about here. The V10 is an incredible machine, but for the price and if you don’t want to change heads constantly if you have more than one flooring type, the Shark IF200UK DuoClean (or one of the other versions) is a good buy. Just keep in mind that if you want to make it your main vacuum then you may have to clean one room or section of the home at a time rather than the whole house due to the battery life. If you have pets then definitely consider the motorized pet tool, though this can be purchased separately relatively inexpensively. What are the DuoClean Flexology Dimensions? How much does this vacuum cleaner weigh? Do the brushes get clogged, and if so, are they easy to clean? They can become clogged with hair on occasion, although there is an access panel at the top of the DuoClean head that allows you to clean them. The included instruction manual provides step by step instructions to do this. Is this good for pets? The DuoClean is an effective vacuum cleaner if you have cats or short-haired pets, but may not be best if you have long haired dogs that shed a lot. How effective it is will also depend on your flooring type and how embedded the hair gets. Is it possible to purchase an additional battery? Yes. A wide range of spares and accessories are available online including spare batteries and dock chargers.